Hi all, Little Dog here. It's summer and time for reading at the beach, on the porch and even on the couch. Spoiler: I can't read. But that doesn't mean I don't enjoy the beach, the porch and the couch. And walks, I love walks, but I digress. 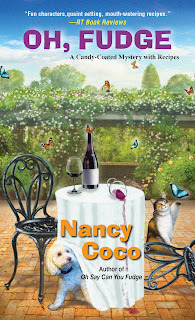 To celebrate the season, my coworker -Nancy Parra AKA Nancy Coco is giving away an Advanced Reader Copy of the upcoming summer read, Oh, Fudge. I'm on the cover there. See? That's me, well, Mal from the Candy-Coated mystery series who is me-because life is all about me and I'm cute. Right? Ignore the cat. 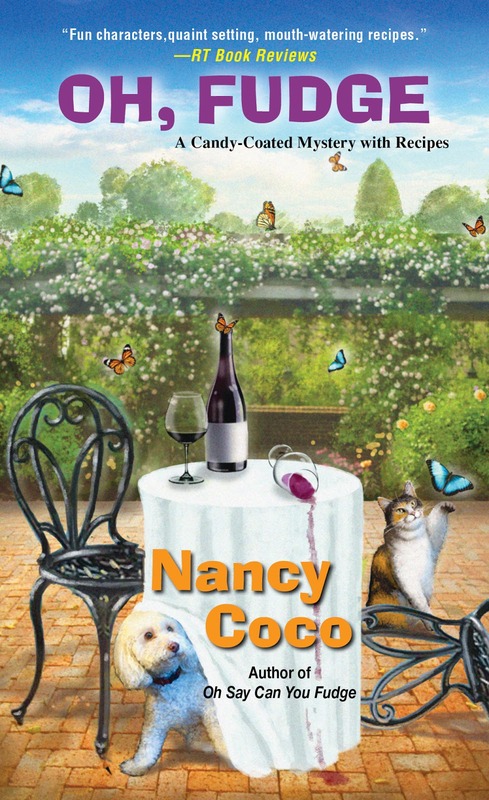 My coworker tells me the lasted book in the series, Oh, Fudge comes out Aug 29, 2017 and can be preordered at your favorite book establishment-hopefully one that allows dogs. An Advanced Reader Copy means you get to read the book before anyone else-cool, right? All we ask is that you leave an honest review at your favorite place to talk about books. Just keep in mind that further editing was done after the ARC was printed so things might differ slightly in the final work. Speaking of final work. I need to get back to my office and get to work on the next Candy-Coated Mystery. Oh, and you need to do a little work in order to win. Please leave a comment on your favorite place for summer reading below and Good Luck! I'll be back to pick a winner. My favorite place to read is outside on the porch or down by the River in the summertime. Both include snacks...in the winter it is my cushy red leather chair. Thank you for the chance to enter. Marilyn, you won the ARC. I'll be emailing you for your snail mail address. Congrats! I love to sit outside with a nice class of something cold and relax and read. I love to sit on my patio in the summer and read! Thanks! I like reading under a nice shade tree in my back yard. Nice tall glass of peach tea near by. Thanks for the chance. My favourite place to read is my veranda. Thanks for the chance. I enjoy reading just about anywhere. In the dead of summer it is too humid to read outside much where I live so I settle for inside with a tall glass of lemonade. Since we decided to be real grown-ups last year and have our yards re-done, the backyard is my favorite place to read. It's got lots of sun and plenty of shade depending on the weather and my family is happy to be out there with me so it's a win-win! I love the idea of sitting on my deck, umbrella up, and a good book. The girls (My mini poodle, and pug) are usually with me. The cat even gets in her carrier, and sits there nicely. The reason I say "Idea" is because we have had so many rainy days this spring that it just doesn't work. I look forward to a sunny dry summer, so I can take the family out side. If I win I will review on Good Reads, and probably amazon. In the sunroom, next to a window overlooking the water in my home in Florida. My favorite place to read is on my porch swing in the morning before the sun starts hitting full force. My favorite place to read is wherever and whenever I can grab a few minutes! In my comfy chair on the patio in front of the pond. My favorite summer place to read is a lounge chair in the shade unless it's really hot. Otherwise my bed or a big comfy chair. Fudge sounds delicious right now. You look cute on the cover. Living in Southeast Alaska, my summer is often rainy and cool. We do have some nice days where reading on the boat is fun. Most days though, it is in my house. I have a reading spot with comfy pillows and a blanket in case it gets chilly. There is a table for books, kindle charger, drinks and treats. I also have a comfy spot for my shih tzu who enjoys reading with me. She is very good at picking out good books and is very excited about Oh, Fudge. Zoey was super happy to see Little Dog has a pile of books close by as well as Lambchop. She thinks that is a good sign as it looks like her sleeping area, (though she has her own small blanket just in case she needs it). We both wish you happy reading adventures! I love to sit on my couch in my living room. I have some lovely big trees in my back garden. Ideal for reading beneath in summer. If it's nice outside, I love to sit or lay on the patio and read. If it is too hot then in the chair by the window in air conditioning. I love to read while sitting on a glider out on the back porch. I really enjoy this series. I'm an indoor reader in my recliner in the living room! I like to read in my sunroom or outside on the patio. My favorite place to read is on my deck with a frosty beverage in the summer. In the winter I prefer being in front of the fireplace. But I'll read the Candy Coated mysteries anywhere but would love to read them on vacation on Mackinac Island. My favorite place to read is my swing on the back yard or in my sincere room. My favorite place to read, year round, is snuggled in bed propped up on pillows with my kitty curled up on my stomach. She purrs while I hold the book or Kindle in one hand and scratch her ears with the other. kchinetti at gmail dot com. I like to read in my living room in the air conditioning or at the library. Anywhere cool with A/C. My favorite place is to read is on my screened in porch at our river house. I love to do a two mile walk at 5 am and then hit the pool. Stretching out in a lounger to dry off, with coffee and a book for an hour is the best part of the day!!!!! My favorite summer reading place is sitting at the picnic table-----unless the bugs are out, then it's inside in my big chair. Love reading on my back porch. My favorite place to read in in my easy chair with some Ice water close by. My favorite place to read is in the living room. It's too hot 100+ here in the summer, and no breezes. "It's a dry heat"
I love reading anywhere!! I promise that if I win, I will leave a review. Thank you so much for the chance to win! When I was a kid I loved to read in my tree house. Don't think I could climb a tree now! I'd choose a shady spot in my yard, or out by the Erie Canal. My favorite place to read a book.....out on the water. we have sailed to a small cove and anchored the boat. I pull out a book and a glass of wine...all is good with the world. I enjoy my recliner. In summer it is cool with the ceiling fan and in winter, I have our fireplace nearby for comfort!